Cauley Ferrari in West Bloomfield Township opens its doors today on a redesigned and expanded dealership, a three-year project that saw the sales center move next door for the construction of a second floor as well as added space at a dealership that first opened in 1998. During a grand opening celebration on Friday for some 500 guests, including Sergio Marchionne, chairman and CEO of Fiat Chrysler Automobiles, Ferrari N.V., and Ferrari S.p.A., several Ferrari executives, and local dignitaries, Jeff and Joe Cauley, co-owners of Cauley Ferrari, cut the ribbon on what is arguably the finest of Ferrari’s 37 dealerships in the country. 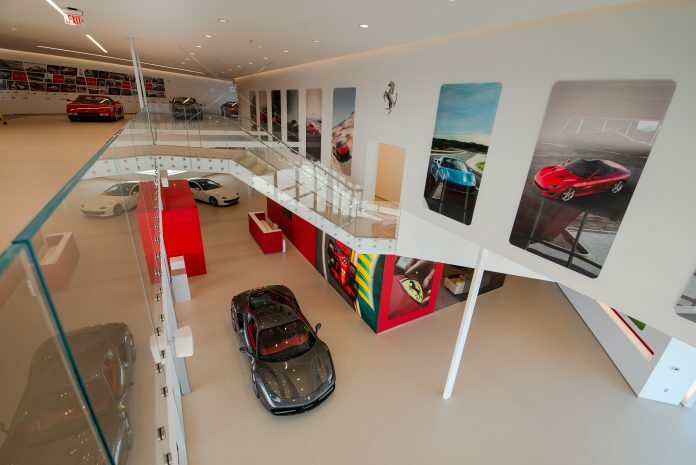 During a recent tour of the 53,000-square-foot dealership, Cauley showed off the showroom that includes a glass curtain wall facing Orchard Lake Road (just north of 14 Mile Road), a reception desk, a Ferrari lounge furnished with Poltrona Frau leather couches and armchairs (the same leather used in the cars), and a design centre outfitted with an advanced computer system where customers, working with a sales specialist, can design a new model. The centre also includes a display of leather samples, seats, steering wheels, rims, and brake systems. Other first floor offerings include a body shop with Corghi four-wheel alignment equipment, a detail center, a prep area, two paint booths (one of which includes a lift to provide for a more exacting application of PPG waterborne paint), a parts storage room, and gleaming white offices. The space includes mounted JBL speakers, the same sound system used in the vehicles, along with two displays of miniature Ferrari models. Along a spacious front window on the second level is a red 1981 Berlinetta Boxer 512 that can be seen from Orchard Lake Road. Other attributes include a three-sided natural gas fireplace, a rustic wood mantle that includes a copy of the menu from Ristorante Cavallino located just outside the gates of the Ferrari factory in Maranello, Italy, a picture of founder Enzo Ferrari’s Italian home, and additional memorabilia. Other appointments of what is dubbed “Casa Ferrari” include a Yamaha piano, Poltrona Frau leather couches, armchairs, and a fireside bench seat, several balconies, and an outdoor deck. The rear portion of the second floor includes additional storage area and a vehicle lift. The dealership sells up to 50 new vehicles each year, along with up to 50 certified, pre-owned vehicles. Prices range from $215,000 to more than $1 million for a LaFerrari. It also can service other luxury vehicles. The Fortebis Group in Italy designed the expanded dealership in tandem with Inform Studio in Northville. The neighboring space where Ferrari operated for three years has been sold, Cauley says. To the southwest of the expanded dealership is an emerging mixed-use development by Grand Sakwa Properties inc. in Farmington Hills that includes a new retail center along Orchard lake Road, while several dozen apartments are going up behind the center.